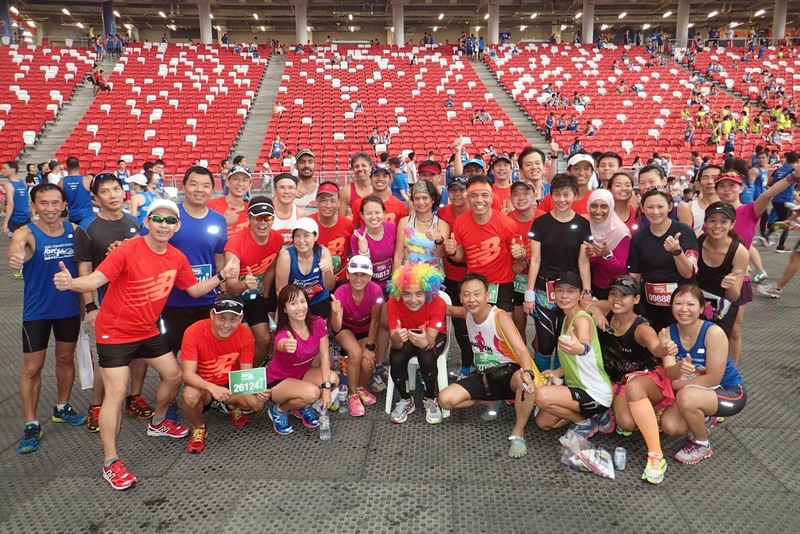 When Team FatBird was first approached to field a team of Official Pacers for the Straits Times Run @ The Hub (ST Run), we were all excited and eager to be involved as this was the first time ever that runners would finish the race in the newly minted Sports Hub Stadium and that we would be pacing and leading groups to finish strongly on the Stadium track. 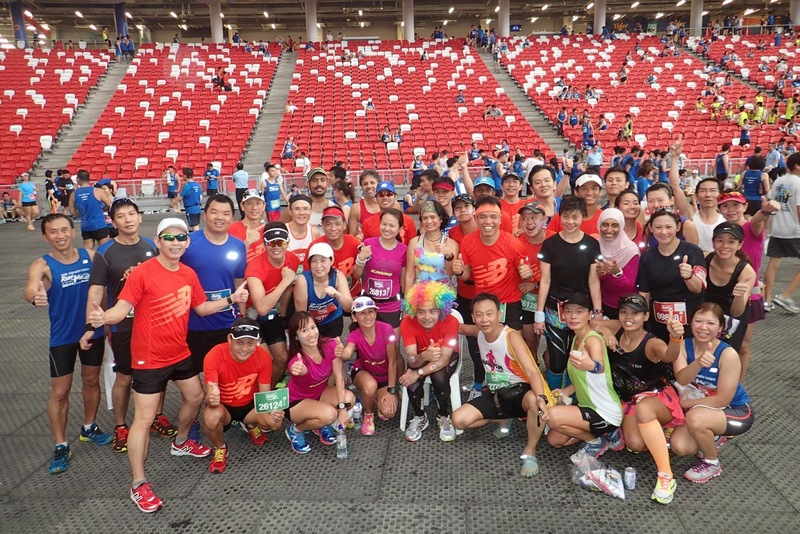 In the run up to the race, we conducted and lead a series of successful 3 training runs to prepare ST Runners for a good run, developing their ability to pace well throughout the 21km and along segments of the actual race route for familiarization. 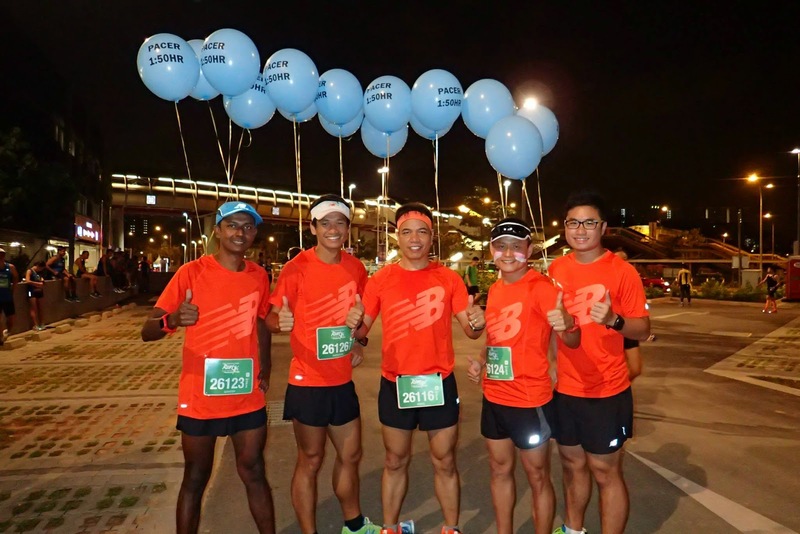 After 2 months of tuning up, our experienced Team FatBird Pacers were all set for the mission with the pace groupings of 1:50h, 2:00h, 2:15h and 2:30h. 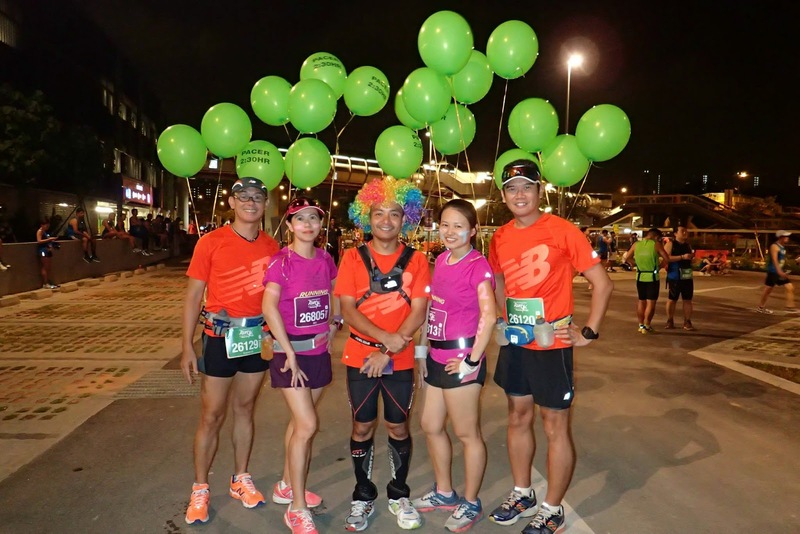 We gathered at 4:00am at the OCBC Arena vicinity for a light warm up before donning on the color-coded pace balloons on our shoulders. Group photos of the Pacers and runners were the order of the morning, as spirits ran high on being able to complete a good run inside the Stadium, just a short distance from where we were starting off. 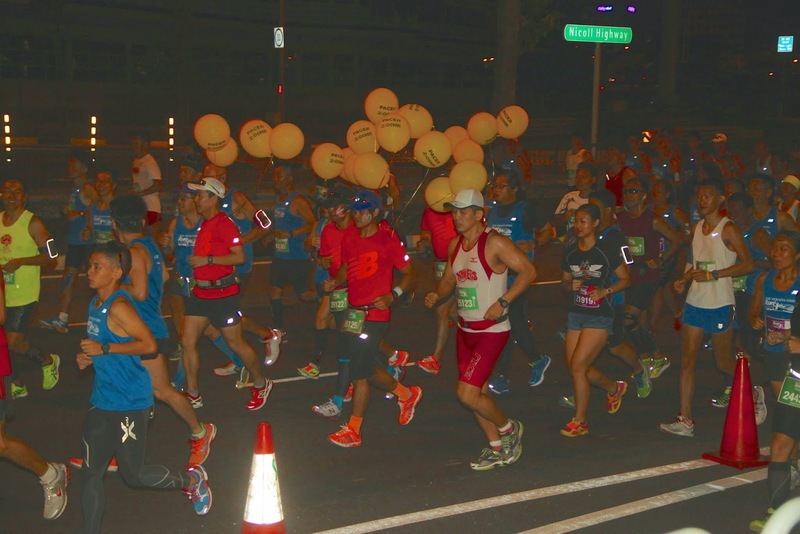 At 4:50am, the Pacers moved into the starting corrals to take up position in their respective timing zones. 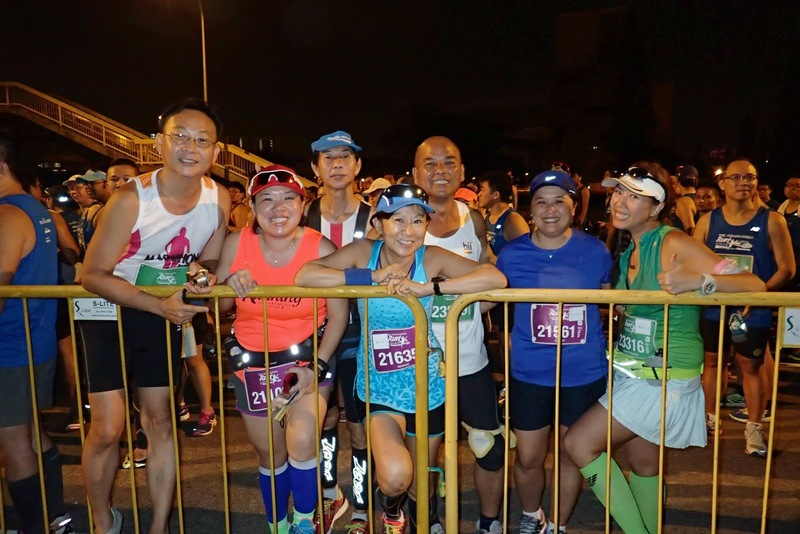 The runners joined in the their Pace groupings for a 2-wave start at 5:30am. 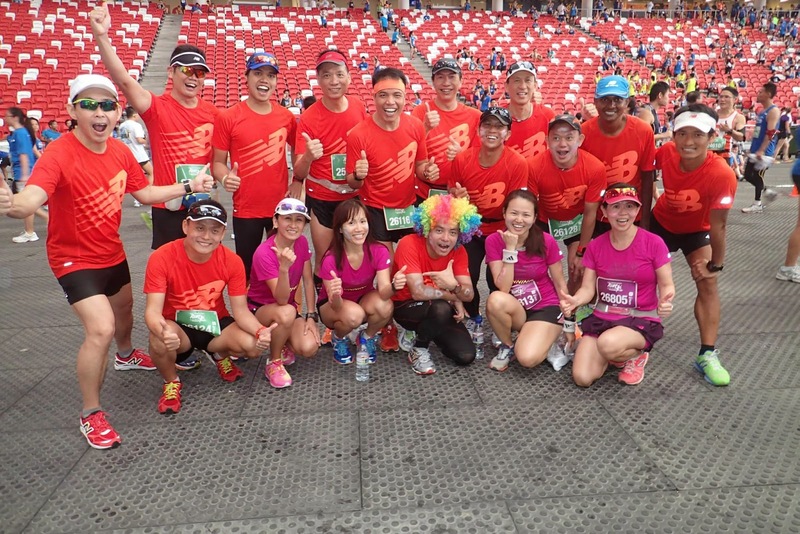 As the Race MC introduced the Pacers and built up the excitement of the runners, smiles were all round in spite of the rather humid morning without much of a breeze. 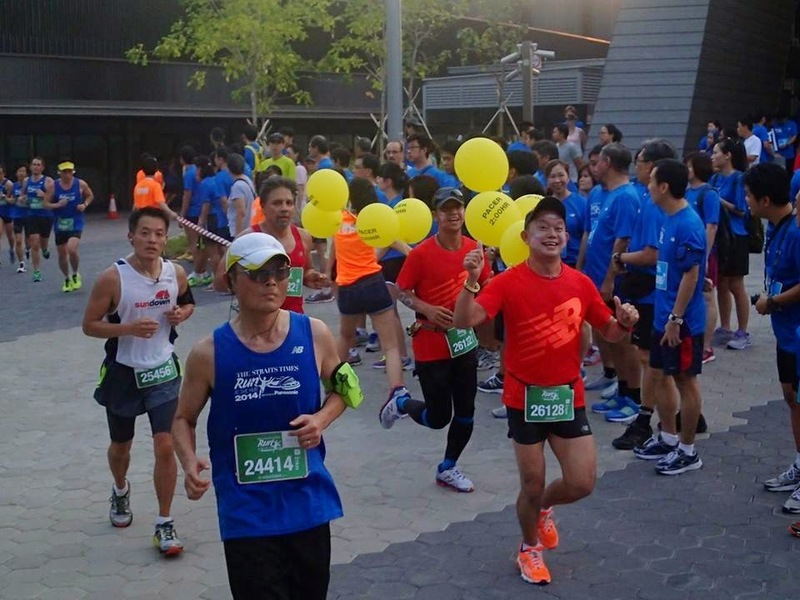 Once the race was flagged off, we ran at an even race pace for the first 3km which allowed the runners to warm up on the run and find the Pacers. 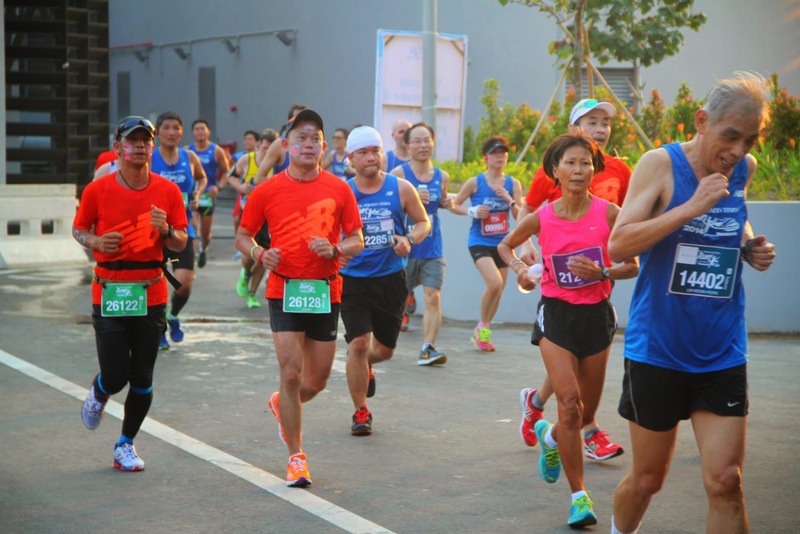 The Pacers tried to spread out within the Pace Groups where possible to prevent bunching in and blocking some of the narrow parts of the course – that worked well as many of the runners were able to keep in pace, following different pacers within the same pace group. After 3km, we progressively moved up the pace till we reached Optimal Pace (a few seconds faster than race pace) to catch up on some lost time (especially for the 2:15h and 2:30h groups). 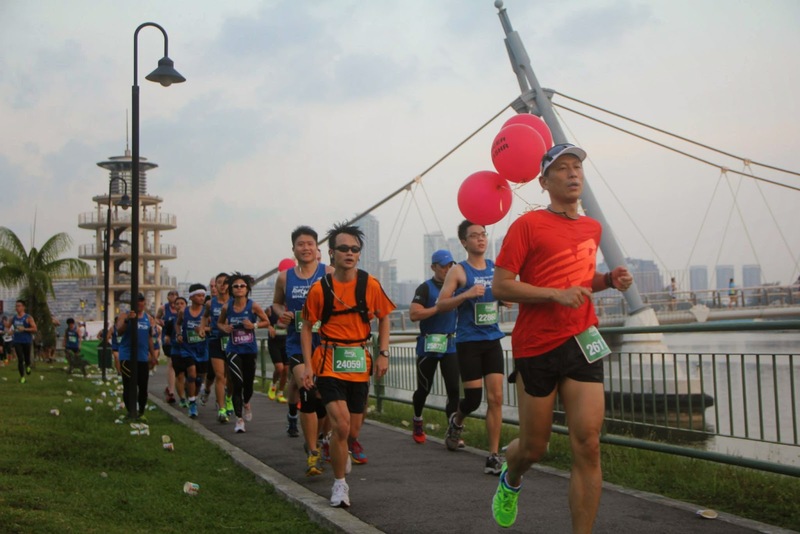 The runners were following the pace well, controlling themselves not to run too fast ahead lest they fatigue fast and pay for it in the later km. 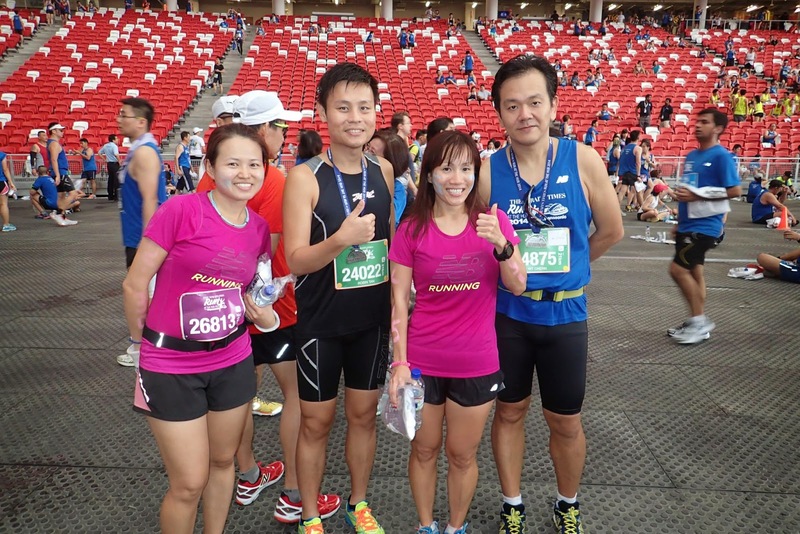 The route was pretty smooth as we ran though the F1 area, Shenton Way and then onto the Marina Promontory. 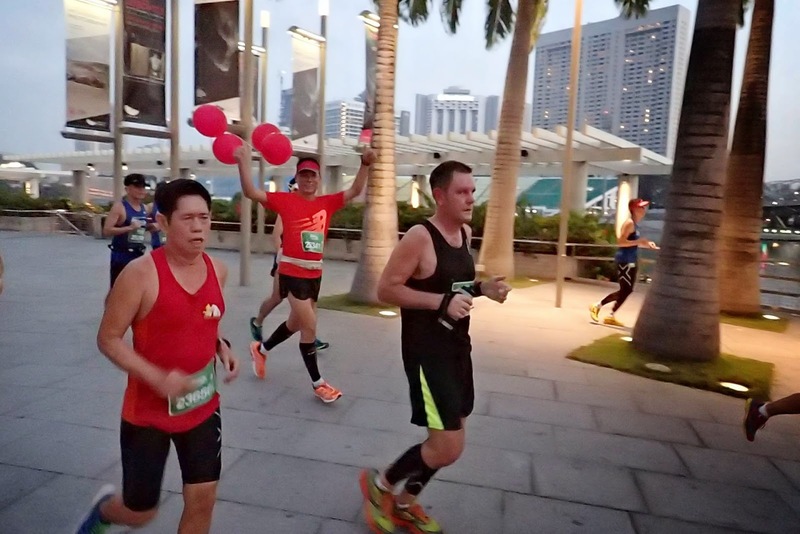 By the time we hit 10km along MBS, the pace was Optimal – on target. 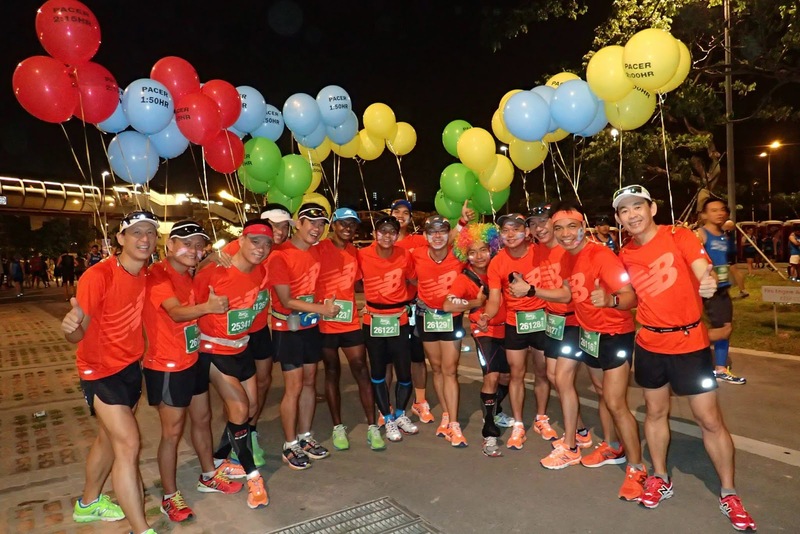 The spirits of the runners were high as they felt comfortable and were more confident of achieving their goal finish timings. 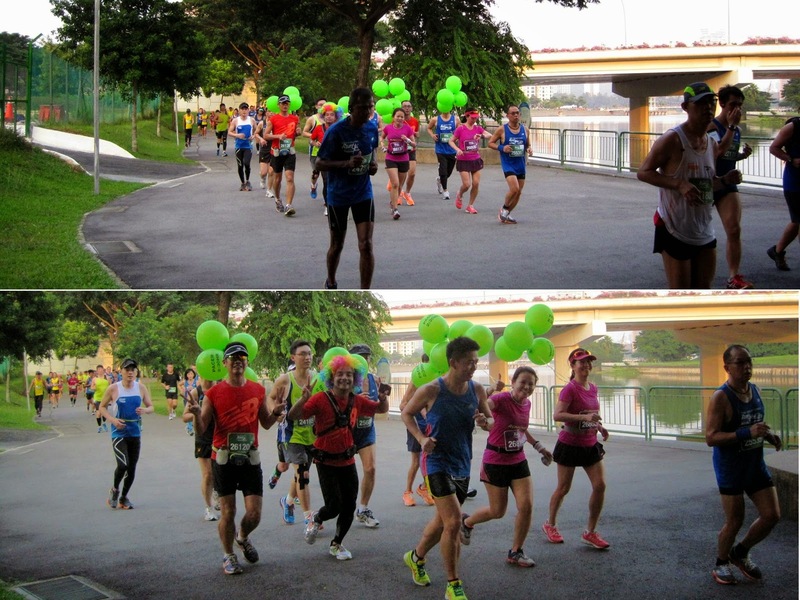 As we continued on to Marina Barrage and onto Gardens By The Bay, daylight provided good visibility as we continued to maintain Optimal Pace. By then we had banked in a slight buffer of about 1min (which came in useful for the later groups who did get caught up in a merge with the 10km runners). A few of the runners popped in gels at that point to keep their paces sustainable. 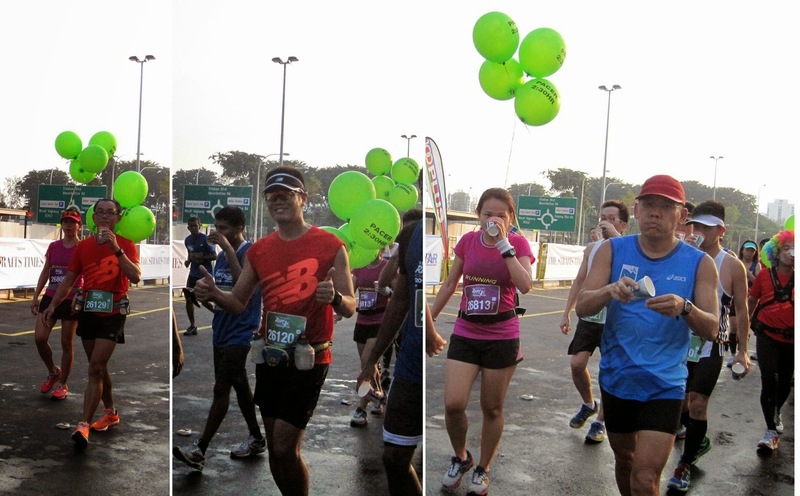 Water points were ample to keep us well hydrated and able to sustain race efforts in the humid weather. 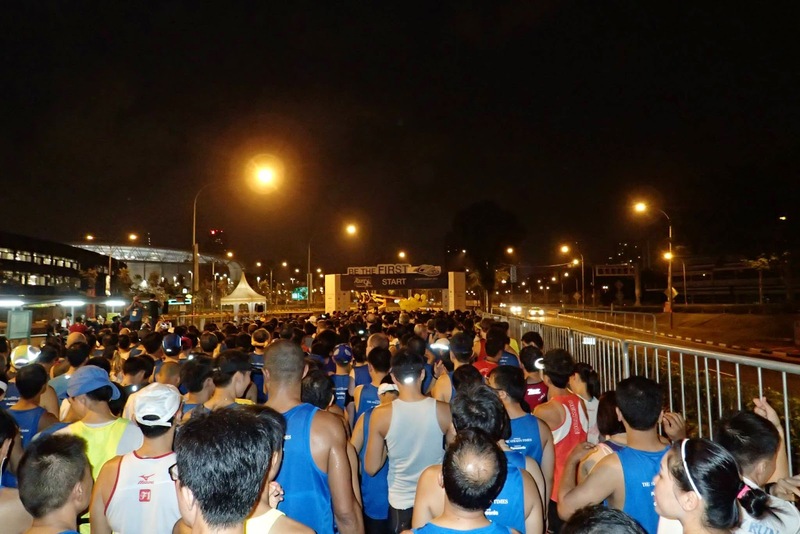 Because of the early start, the sun was not apparent when we hit the 15km mark along Geylang PCN area. 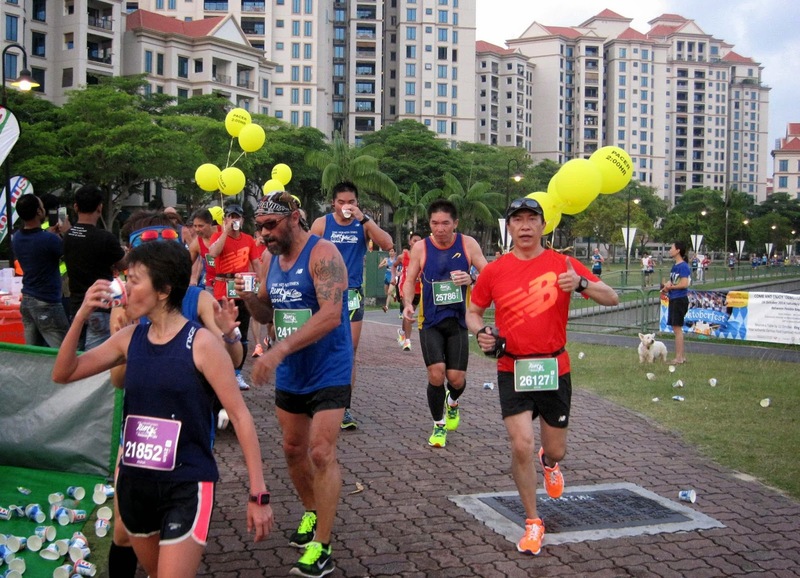 With only 6km to go, some of the runners were seen to be slowing down. With the encouragement of the Pacers and the small buffer they had accumulated, the determined racers were not about to give that margin away without a good ‘fight’. 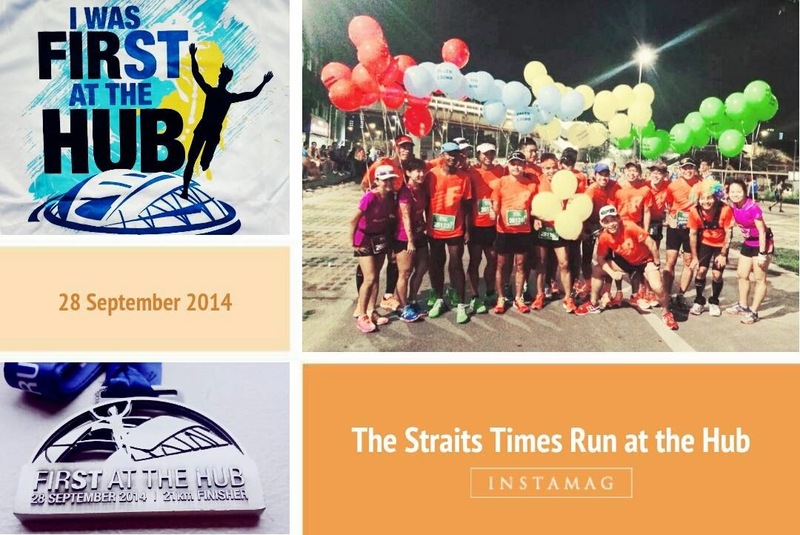 The ST Runners persisted and sustained till the 18km mark when we turned into the Sports Hub. 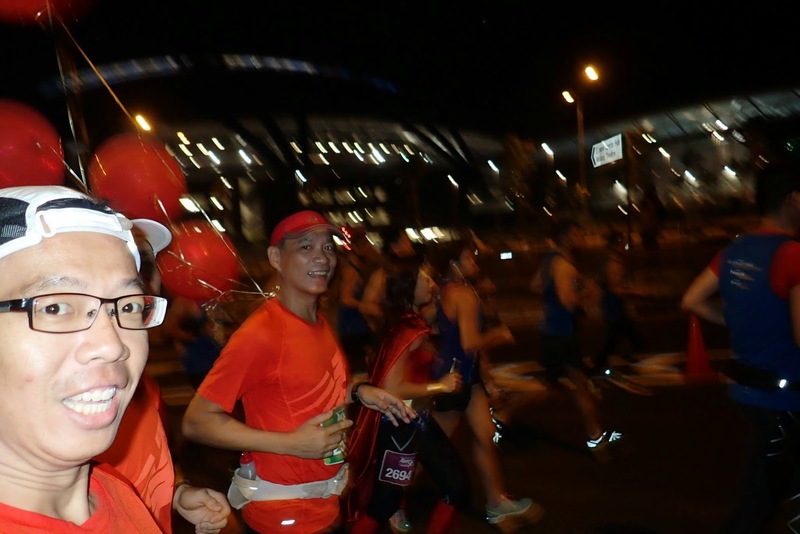 That we were on Stadium grounds perked up the runners who were getting all excited and motivated. The stronger ones were asked to move ahead while we encouraged those slightly behind that they were within reach of their final objectives. 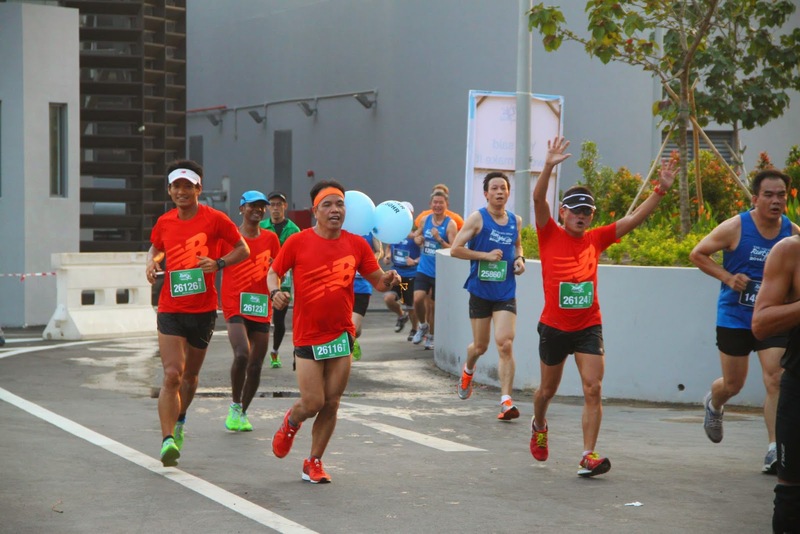 The finishing 2km was great as the bunch of friends and supporters lined along the run path cheering us as we looped back to the Stadium. 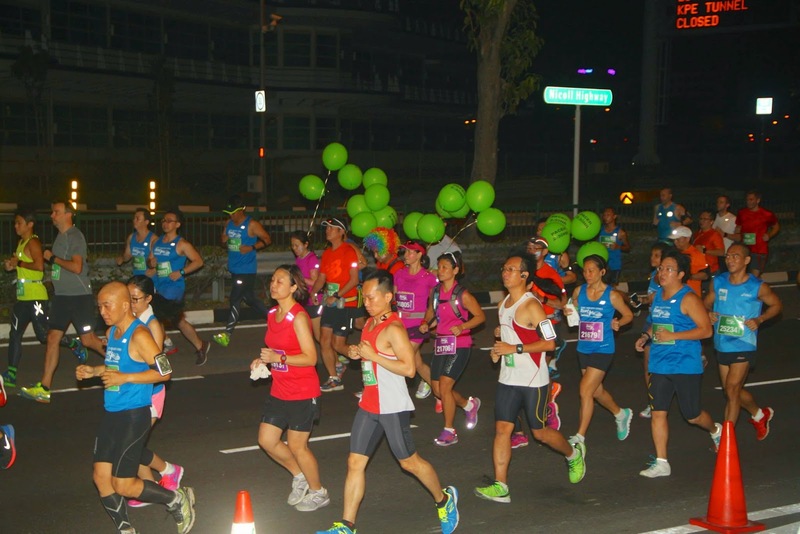 Sensing that we were near, the tiring runners were giving their all for a strong finish. 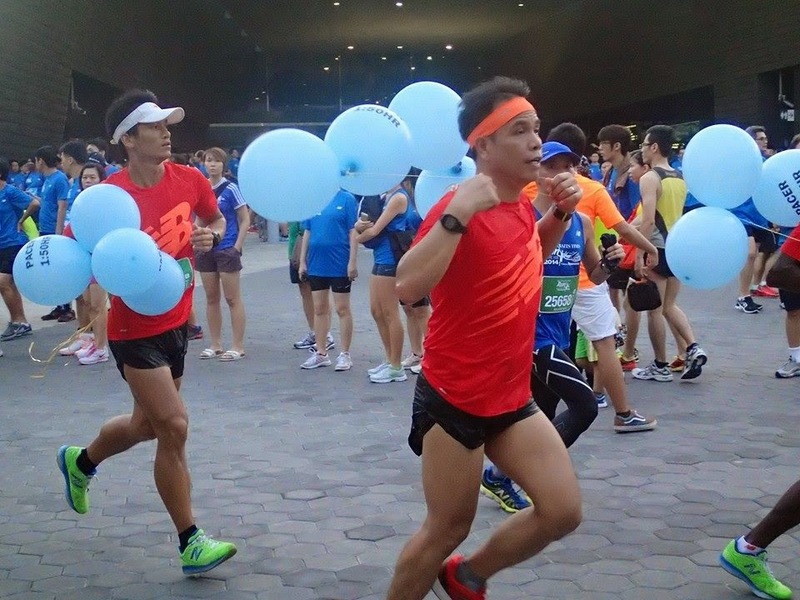 With 500m to go, the Pacers released our balloons (as we were not allowed to wear them inside the Stadium) and continued to cheer and egg the runners on. Because of the 3min buffer we had accumulated, we were able to ‘push’ more runners to go below target timings. 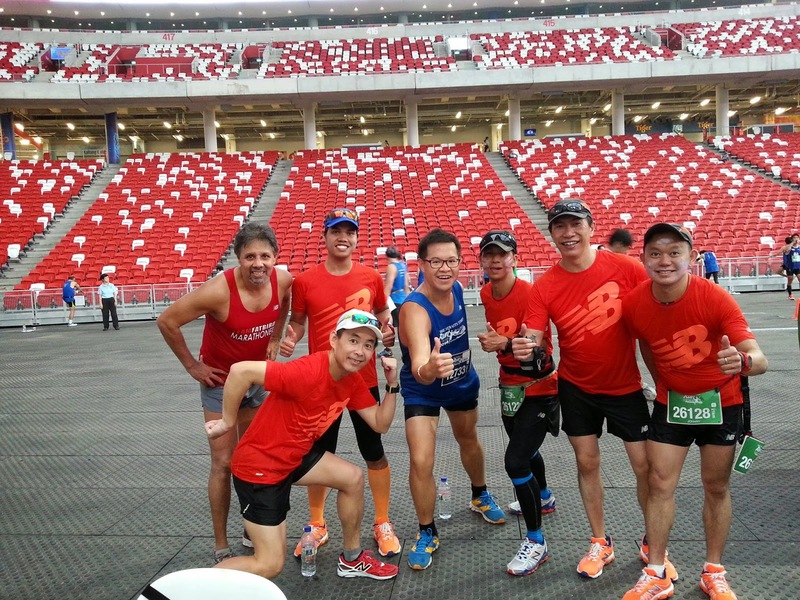 It was a exhilarating feeling when we stepped onto the Stadium Track, a first for many of us. We took our time for the final run up and held our arms up with pride as we crossed the finish line victorious. Lots of congratulations all round to the completing runners, and when we received the many words of thanks and appreciation from the runners who had followed the Pacers to their best timings (many by a good margin), it made the race that much more memorable and satisfying for our Pacer team. 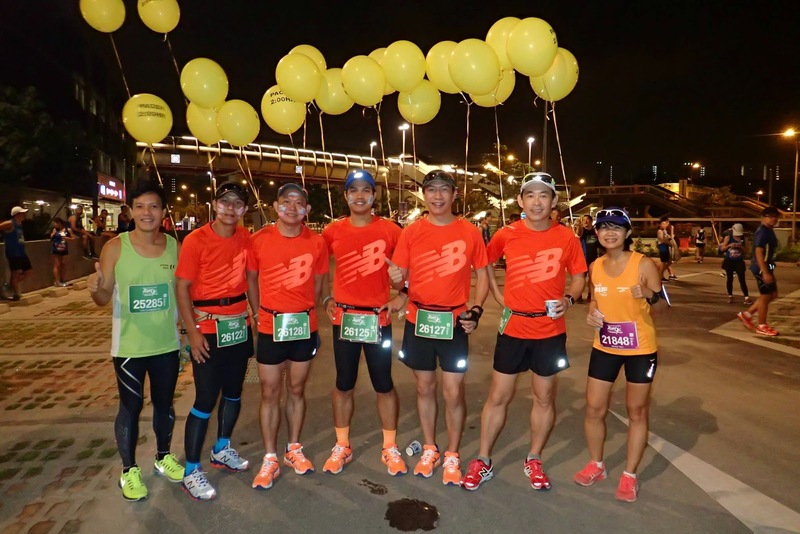 We collected our well earned finisher tee and medals before proceeding to the New Balance booth for group photos and exchanges of our good race experiences. 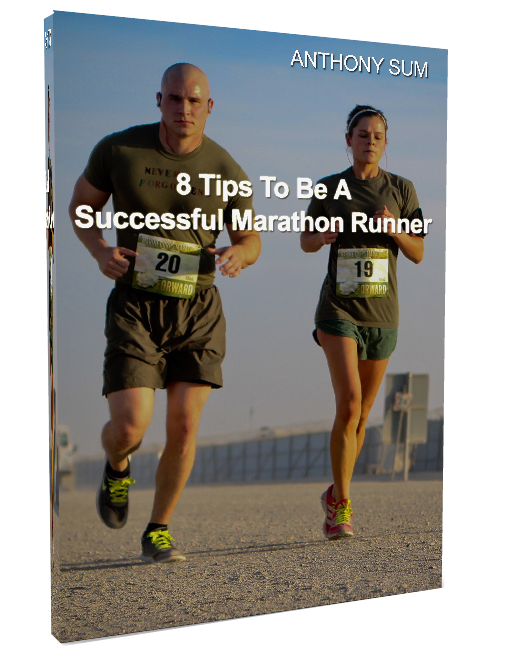 There were many Personal Bests reported, as well as notable achievements of firsts at a Half Marathon. 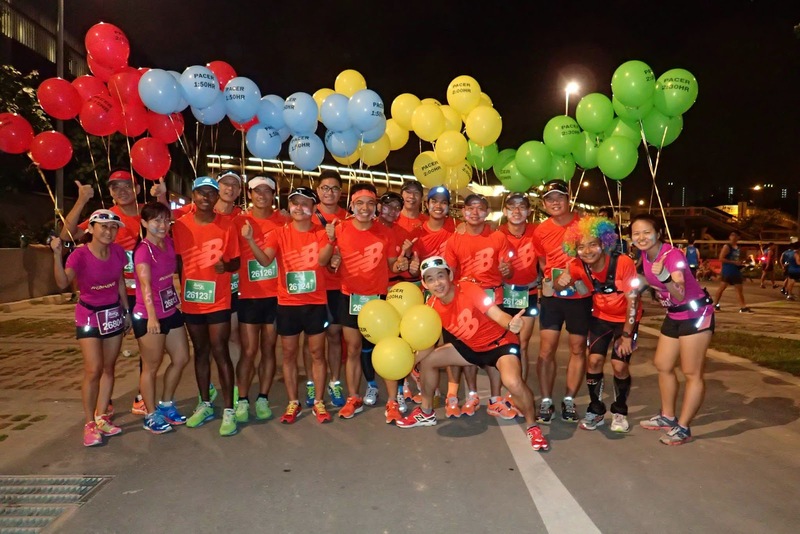 The 10km runners too joined us to celebrate their victories. 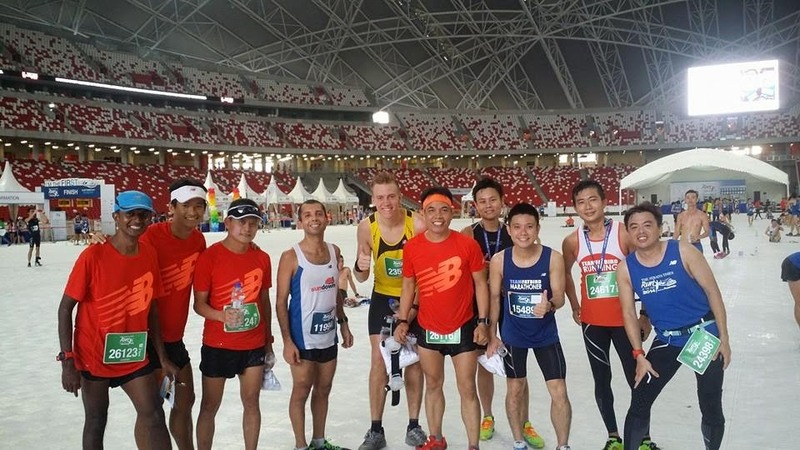 The entire stadium was spacious and well ventilated with air conditioned comfort, a luxury for most of us marathoners who were used to congested finish points with the elements and crowd in other races. 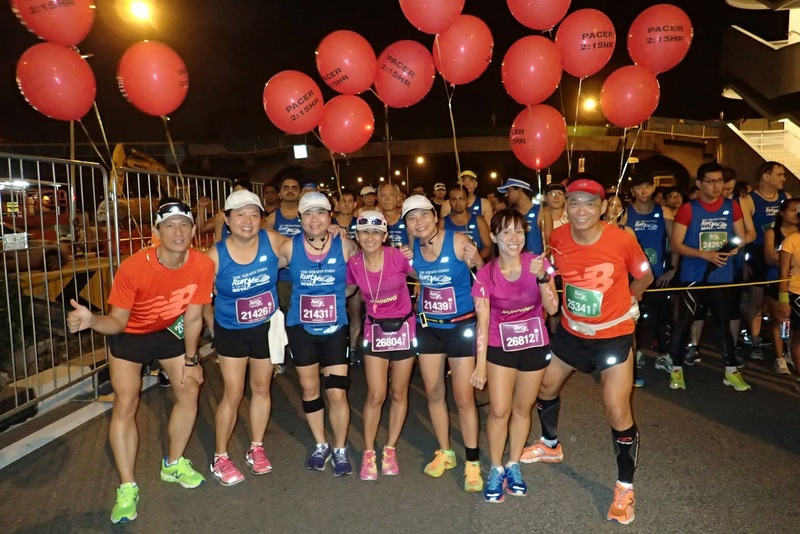 All the Pacers in the respective groups achieved our mission with flying colours, in the process helping many runners achieve more than their expected target results. Bouquets and accolades for this team of Pacers who have worked hard to bring their best out for the ST Runners. Overall, it was an excellent race in nice weather in a well-planned route which minimized as much as possible potential bottlenecks and choke points to bring us a most enjoyable and satisfying race experience. 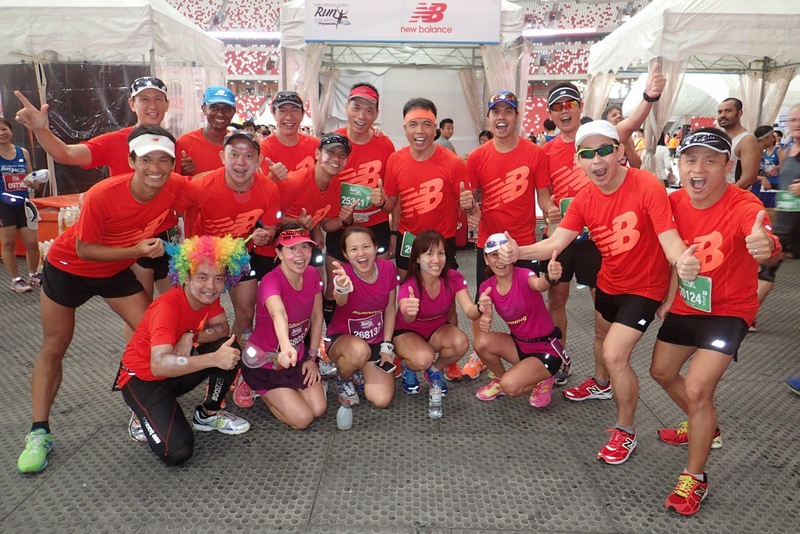 A shout out to New Balance who initiated and supported the Pacer team; the race organizer, Infinitus Productions for a well organized and executed race; and to The Straits Times for putting up an unique experience of finishing at the Sports Hub Stadium and giving all of us runners bragging rights of “I am the first to finish at the Hub”.